To make this salad you need to have cooked some lentils. 1. Wash Lentils: Measure the lentils into a colander. Pick over and remove any shriveled lentils, debris, or rocks. Thoroughly rinse under running water. 3. Cook the Lentils: Bring the water to a rapid simmer over medium-high heat, then reduce the heat to maintain a very gentle simmer. Cook, uncovered, for 20-30 minutes. Add water as needed to make sure the lentils are just barely covered. 4. Salt the Lentils: Lentils are cooked as soon as they are tender and no longer crunchy. Strain the lentils and remove any seasonings. Add salt as needed. Cool before you use. 5. Store lentils in the fridge for up to a week. Now I have lentils ready to make my cold lentil salad. Take a nice individual plate. Add lentils. On top of lentils add some celeri cut in small pieces and cilantro. 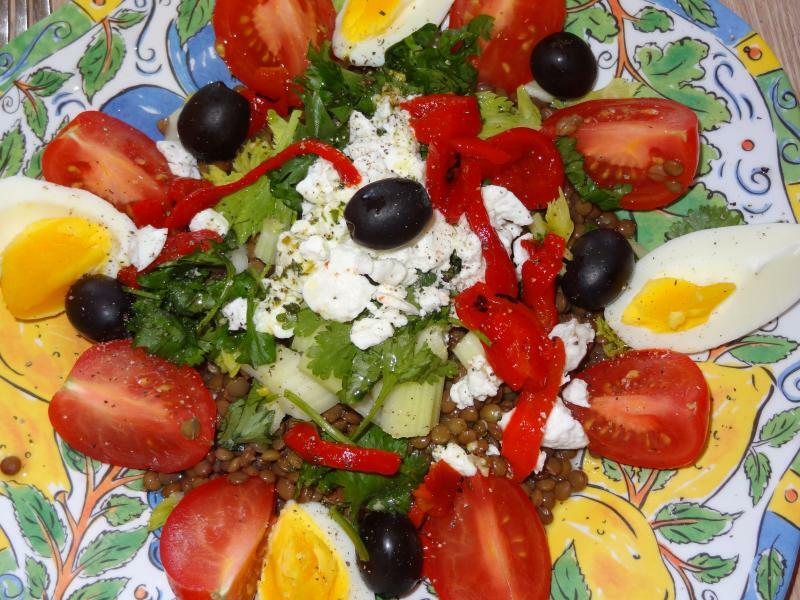 Take a hard boil egg and cut 2 tomatoes to decorate around the lentils. add some feta cheese, roasted bell pepper strips and black olives. Pepper to your taste. Add 2 tsp of French vinaigrette. 2. Mix in the Dijon mustard, then add 3 tablespoons (45 ml) of olive oil. Stir well, then taste. If too sharp, add the additional olive oil and more salt, if necessary.